ALBUQUERQUE, N.M. — A two-year, $3.8 million award has been received by Sandia National Laboratories and the University of Rochester’s Laboratory for Laser Energetics (LLE) to hasten the day of low-cost, high-yield fusion reactions for energy purposes. 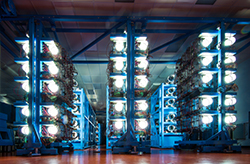 Amplified light passes through the large tubes of Sandia National Laboratories’ Z-Beamlet laser, one of the most powerful in the world. (Photo by Randy Montoya) Click on the thumbnail for a high-resolution image. High-yield means much more energy emerging from a fusion reaction than is put into it. The award, announced by the Department of Energy’s Advanced Research Projects Agency-Energy (ARPA-E), seeks to build upon recent successes of Sandia’s Magnetized Liner Inertial Fusion (MagLIF) concept. “Liner” is the technical term for “cylinder” and “inertial” refers to the immobility of the target object. Originally proposed in a 2010 Sandia theoretical paper, the concept uses a laser to heat fusion fuel contained in a small cylinder as it is compressed by the huge magnetic field of Sandia’s massive Z accelerator. A secondary magnetic field impedes energy from escaping from the ends of the cylinder, which would lower the temperature of the fuel and reduce the fusion output. The collaboration will study fusion in a relatively unexplored intermediate density regime between the lower-than-air density of magnetic confinement fusion goal of the ITER project in southern France, and the greater-than-solid density of laser-driven inertial confinement fusion at the National Ignition Facility at Lawrence Livermore National Laboratory. The LLE’s OMEGA laser, funded and operated as a national user facility with more diagnostics than Z’s Beamlet laser, is expected to greatly speed the work. 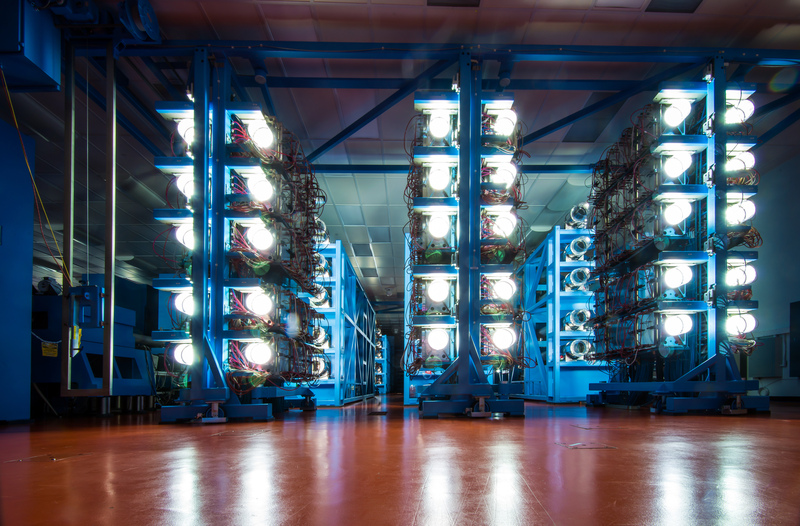 Twenty-centimeter disk amplifiers used to energize 60 laser beams glow brightly at the 100-meter-long OMEGA laser at the University of Rochester’s Laboratory for Laser Energetics. Both lasers will experiment with more efficiently preheating fusion fuel to improve the output of Sandia’s Magnetized Liner Inertial Fusion technique. (Photo courtesy of University of Rochester) Click on the thumbnail for a high-resolution image. 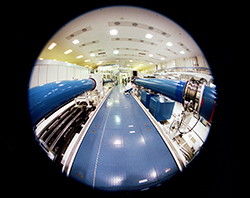 In addition, integrated experiments where some of OMEGA’s lasers are used to actually compress the liner itself, as well as the heated and magnetized fusion fuel it contains, are also part of the ARPA-E program. “With this collaboration, we will apply our expertise to explore a new path in fusion research,” said Davies. The work will consist of several parallel tracks: performing scaled-down MagLIF experiments at the LLE Omega facility; improving performance of full-scale MagLIF experiments on Z through optimized laser pre-heating and improved axial magnetic field hardware; and validating simulations against experiments. The combined heat and pressure, created by the laser preheating and liner imploding over a hundred or so nanoseconds, already have been shown to force fuel to fuse. What’s wanted is a reaction that will force it to fuse more efficiently and, at the same time, allow researchers to learn more about important subsidiary processes. ARPA’s bet, and Sandia’s and Rochester’s with it, is that a more efficient coupling of the laser energy to the fusion fuel would increase the number of neutrons produced, the gold standard in judging the efficiency of the fusion reaction. As it happens, scientists at the LLE over many years have developed techniques to “smooth” laser beams, a prerequisite for delivering more energy to fusion fuel. Other laser experiments will include changing the beam’s intensity, its distance to the liner’s entry port and the size of the liner hole through which the beam must pass. If the beam entrance hole is too small, not enough energy gets through to the target, but if too large, too much energy escapes. The process when optimized should allow fusion reactions to occur at 1 to 2 percent of the density and pressure required in traditional inertial confinement fusion, which has used either laser-created X-ray pulses or direct laser illumination to spherically compress a pea-sized capsule containing fusion fuel. Nuclear fusion joins small atoms like hydrogen, releasing huge amounts of energy in the process. Unlike nuclear fission, which splits large atoms such as uranium, the dream of fusion is that it eventually could provide humanity unlimited energy from sea water and from such abundant elements as lithium.